Home Administrator Zeiss Distagon T* 15/2.8 ZF/ZE - Should You Care? So the rumor mills are working and the latest news is that Carl Zeiss will soon be announcing the new Distagon T* 15/2.8 lens in Nikon ZF.2 and Canon ZE mounts. Originally reported by zeissrumors.com and most recently by photorumors.com, the news spread to the rest of the web within a day. As a long time Zeiss user and aficionado, I got pretty excited about this little piece of news, but then mental gears kicked in and I started to think what does it really mean to the end users like you and me? Should we all get jiggeddy-jaggedy about this and rush with pre-orders, or what? Original Zeiss Distagon 15/3.5 was first released in Rollei mount back in late 70s and at that time was quite a master-piece. Later re-released for Contax and most recently in Leica M mount, the lens was very popular, primarily because of its price. The current version of Distagon 15/2.8 ZM goes for ~$4.600, making it pretty much out of reach for most of us. Ole Contax 15/3.5 sells for ~$2,500 these days. Still a ton of money, particularly when you consider it against what else is available on the market. For Leica mount we have Voigtlander Super Wide Heliar 15/4.5 ASPH goes for ~$600. In Nikon mount we have a couple of interesting options, starting with the uber zoom 14-24/2.8G, than 14/2.8D and finally old 15/3.5 Ai-S. All three cost less than used Contax or new ZM versions. For Canon mount we have the 14/2.8L and slightly longer, yet absolutely superb 17/4L TS-E. Again, both cost less than either of Distagons. Finally, we have a bunch of oddball alternative and 3rd party lenses, some of them now discontinued, from Sigma, Tamron, Tokina, Samyang etc. 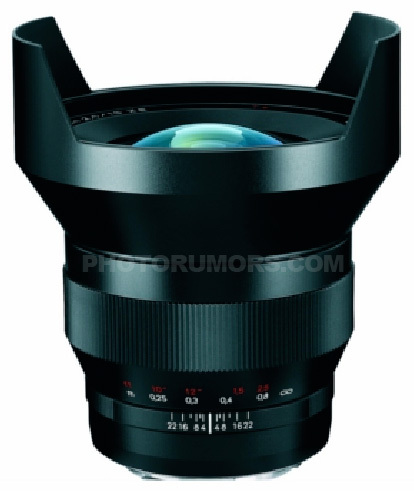 Bottom line is that there are a lot of 14-15mm lenses out there, so it's not like Zeiss is going to be filling in an empty niche... Because of that, I expect that the price point for the SLR version of Distagon 15/2.8 to be significantly below the Leica version of the lens - probably somewhere in the $2,000-$2,500 range. Now, some of the cheaper options available out there are not particularly.good - resolution, distortion, CA etc. So naturally many who are not happy with the alternatives are looking at Zeiss as a premium lens designer who can solve all of these problems, in which case, the argument goes, the premium price for Distagon 15/2.8 is going to be justified. But is it a realistic expectation? At a minimum, I expect that the new SLR version of Distagon 15/2.8 will have a fairly good resolution. ZM version certainly improved in this domain over the old Contax version - see MTF charts below (Distagon 15/2.8 ZM is at the top and Contax 15/3.5 is at the bottom). However, distortion remains pretty much the same, as can be observed from the charts (ZM is on the left, Contax is on the right). And I expect that other characteristics like vignetting and aberration, will most likely be similar as well.